I have never been a big fan of sugar cereal. I guess it comes from my upbringing. My mom did not allow my brother and I to have much sugar cereal as children. The main reason was because we were both pretty hyper-active and sugar just made it worse. So my mom did what she could to limit our sugar intake. Of course we hated it, I mean what child DOESN’T want to have sugar? LOL But now that I have my own children, I totally understand. A hyper child is NOT easy to deal with. Well, I also do the same with my children. I would rather them NOT have sugar cereal for breakfast. There are lots of healthy alternatives. Some of the usual cereals that I keep in the house are Cheerios, Kix, Life, and Rice Krispies. I am sure those of you on the WIC program notice that those are some of the cereals allowed for purchase. There is a reason for that. These are much more healthy than the cereals that are loaded with sugar. I do not intentionally buy sugar cereals, but every once in a while our church food ministry blesses us with bags of food (huge help in these trying times). 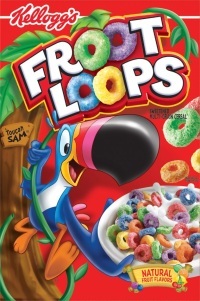 Well, this last time, there were 2 boxes of sugar cereal (Froot Loops and Apple Jacks). Of course my kids want to eat it EVERY single morning for breakfast and even for snack. So, I came up with a plan to limit their sugar cereal intake by only allowing them to eat the cereal if it is mixed with a NON sugar cereal. I have them pour on of the regular cereal in their bowl and then top it off with a small amount of the sugar cereal. So far this idea is working well. How about you? What are your thoughts on sugar cereal? Do you love it? Hate it? Do you think it matters whether or not our children have a healthy breakfast? Would love to hear your comments!